Instagram’s new Nametag tool works much like QR codes. The customisable graphic can be scanned to find new profiles and can also be shared on other platforms to make profiles discoverable. Instagram has introduced a new Nametag tool to make it easier to discover new profiles and make your own profile more discoverable. 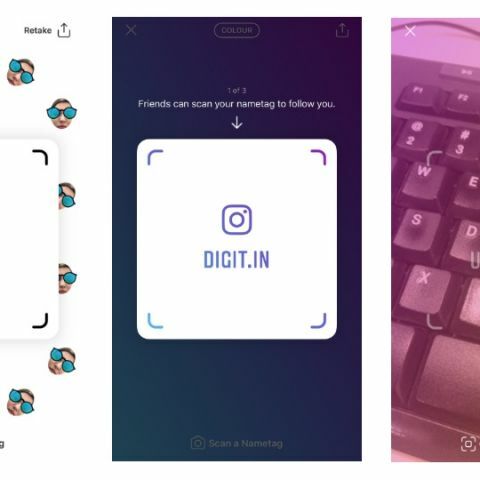 Instagram Nametags work just like QR codes, only you can customise your own Nametag with a selfie, stickers, emojis and colours. Once the graphic is created, it can be shared through email, WhatsApp, Facebook and almost any other online sharing tool you usually use. Using Instagram Nametags is pretty simple. To create your Nametag, head onto your profile on Instagram and click on the hamburger menu (the button with the three lines) to access the Nametag option. Click on it and the instructions are pretty much self explanatory. You can click a Selfie and tap on it to try out different stickers. The Nametag can be personalised using a selfie, colour, or emoji. The “Scan a Nametag” button is present at the bottom of the screen. Tap it to scan someone's Nametag and start following them. Alternatively, you can also swipe right on the story camera, hover over the nametag, and hold down on your screen. An arrow on the top right corner of your nametag will let you share it on different platforms. Instagram also announced that it is testing a Instagram school communities in the US. The feature is reminiscent of how Facebook first started by making students from various universities connect with each other. Those who choose to join a school community can add a line to their profile listing the name of their university, class year, and any relevant groups such as major, sports team, and sorority. Others who’ve added the same university can click to go to a directory listing all the people—sorted by class year—who have added that university, where they can follow and message. what are new versions of Motorola phones are to be launched ?